Thank you for visiting our brand new website. Our hours of operation are 6:30 a.m. until 6:00 p.m., Monday through Friday, 12 months a year. Our center is an environment in which your child can grow, blossom, and enjoy the excitement, wonder and joys of childhood. Our primary goal is to provide a safe and nurturing environment while promoting the physical, social, emotional, & intellectual development of young children. 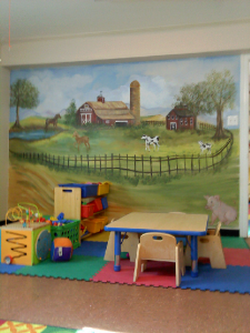 Our aim is to be much more than a childcare center. As early childcare educators, we offer developmentally appropriate and stimulating curriculums such as A Beka Book & High Reach Learning. The environment that children encounter is an exciting one, full of materials to manipulate, carefully chosen toys that allow for creative play, and opportunities to create and explore with paint, clay and other media. We believe that play is central to the young child's world. Through play, young children learn to make sense of their physical, social and cultural environment . Children develop cooperation and enthusiasm for learning, creative thinking and problem solving skills through play situations that are carefully structured by experienced teachers. We encourage them to express feelings such as sadness, happiness, fear, anger, and love. We believe the development of such skills will assist children in continuing their education and forming peer relationships with confidence. It is our intention to provide opportunities for parents to meet and discuss common concerns with teachers and staff. Here at Charlotte's Web we ALWAYS have an "OPEN DOOR POLICY" .